Of the many gifts that come with homeschooling, the one I am truly loving right now is the freedom to make changes as needed. Doesn’t it seem rather impossible to sit down over the summer and plan an entire school year, sight unseen, knowing how the whole thing will unfold? Despite careful research and planning, the science curriculum we chose was all wrong for our daughter. And it wasn’t for lack of trying. Several approaches, on our part and hers were put forth in an effort to find a workable place with this text. We very carefully considered the idea of switching before doing so. Sure, we invested good money in the book; but more importantly, we value commitment and dedication, and do our best to instill those same values in our daughter. We didn’t want to send the wrong message. You can’t walk away from everything in life that isn’t super fun. I don’t expect her to feel warm and fuzzy about every single part of our school day. As humans we need to grow and stretch ourselves in new directions. It’s okay to be bored sometimes, to persevere at other times, be diligent, work hard. As a family, we value all of that. However, it is also important to know when your child isn’t persevering, they’re enduring. There is a difference. The writing on the wall says it’s time to make a change. How did we know it was time to move on? The subject was not self initiated. Yes, I believe a little struggle builds character, but having a bad day or a bad chapter in a subject is not the same as almost never having a good day. We look for the lingering moments as homeschoolers, don’t we? The lesson provokes an idea that leads to research and ten books checked out of the library. The concept is applied to all sorts of play long after ‘school’ is over. She used to love this subject. Years prior, in school and in play, science was always thought of as cool, fun, interesting! Now the spark was totally gone and there was only one variable in the equation. It was over the holidays that we made the exciting decision to switch – because we can, we’re homeschoolers! We are free to redirect ourselves as needed, and it felt incredibly good to put that freedom into action. I am not kidding when I tell you that all is not only good in our science world, things are excellent and there is even talk about it being a “favorite” subject. There are twice weekly experiments. A “lab journal” that is added to with each experiment. The textbook layout aligns with my daughter’s learning style (orderly). Critical names, dates, definitions are nice and bold, italicized, featured. Lessons flow with a familiar sequence. A companion DVD contains supplemental videos and demonstrations. The reason we let go of one curriculum (Oak Meadow – Physical Science) and made a new choice mid-year (Apologia – General Science) has little to do with one being better than the other. They are designed very differently–and that has made all the difference for the style of learner my daughter is. My daughter likes the systematic flow that Apologia offers. Modules are well organized with key words and phrases clearly emphasized. There are plenty of experiments that work well and are presented in a clear step-by-step approach with a useful list of supplies for each one. There is a pre-test and and a final test with each Module, giving a sense of completion and accomplishment (for kids that seek that type of experience). These are all methods that work for her as opposed to the slightly more organic approach of Oak Meadow. Assignments and experiments are more blended into the lessons, sometimes catching us by surprise from paragraph to paragraph. For us, it was about finding the correct style with which to deliver the content. We didn’t love science, and now we do love science. All because we read the writing on the wall and decided not to worry about the financial investment of the first curriculum, but rather focus on the overall investment of the human experience. I think we got this one right. Have you had a recent highlight in your homeschool? Big or small, tell us about it. 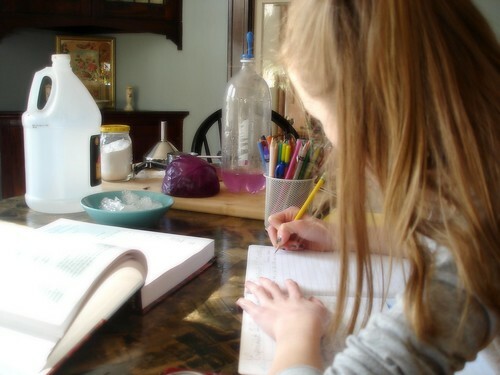 The beauty of homeschooling IS to make changes and find the ways that work best for the child. I recently had a revelation with my 6 year old. It was pure drudgery when it came to reading and it was really affecting her self-confidence. I was so focused on getting the lesson complete that I almost missed her plea to slow down. Now we have taken a step back from her curriculum and just focusing on what she likes…forming sentences with cards, dictation, and extra kisses from me. Perfect. I am so thankful we too homeschool. After much research, prayer, and thought, we decided to go with a popular “box” curriculum to study American History. My two oldest boys, the ones studying this, have very different learning styles. One LOVES to read and study, the other wants the facts, and just the facts so that he can get on with LIFE. Neither boy was happy. They both tolerated it because I said so, but I could see they hated it. I did too, truth be told. So I switched to a textbook style. Thankfully, it is well written and is very engaging. They are learning SO much more this way. I won’t name the other curric. because I think it is a great one. It just wasn’t a good fit for us. I appreciate you naming what you use. I was wondering. All three of my children learn so differently I don’t know what we’ll use when the time comes for science curriculum. But your brief analysis here (I know your post was more about embracing change than it was about a curriculum per se) gives me some clues as to which of these might work better for one of more of our children. Our recent change was to dump all our workbook type stuff (very minimal) and go totally unschooling for this season of life. We completely changed our predominant homeschooling “style” last year. I really liked the theory behind Classical education, but it just didn’t work well for our boys. Quite honestly, they got bored with spending an entire year on one branch of science or one historical period. We switched to the Core Knowledge system, which uses more of a spiral approach, and the spark is back! I am still using a lot of our Classical materials, just breaking them up so they fit the Core Knowledge sequence better. Exactly! What we’ve done is buy all four years’ worth of science and we rotate subjects quarterly. So we did Physics from Sept-Nov, went to minimal schooling in Dec, then did Astronomy from Jan – Feb, and are starting Life Science now that it’s spring and we can do a lot more outdoor work, zoo field trips, hiking etc. Ooh … I loved this. We are really just getting started here, and I often feel tempted to try something different because we are finding our way. The way you break down your experience really helped me (and I’m sure will help in the future too). It’s good to have a way to help determine when it really is time to switch, and when I am just being tempted by something different that looks fun or interesting. Thanks!! Thank you so much for sharing this and naming what you are using. What is the age range for the science you are switched to? you are welcome! the age range is middle school, 7th or 8th grade. heather’s latest post: simple homeschool today! In some ways, the question makes me smile, but I understand the crux- the fear- that change might affect education. But I think you’ve encapsulated so well here all the reasons change can be good in an educational journey, particularly with different learning styles. Math was my biggest challenge growing up- and curriculum was woefully “slim pickings” back then- but my mom kept trying until we found one that fit the way my brain worked. I can think of seven *major* curriculum changes I had just in the middle school/high school years over all. The moms I talk to seem to feel better when I tell them the endpoint (double BA in English & History, with honors), but to me, that’s the wrong ‘ruler’ to judge by, because not every child or homeschool student pursues a ‘traditional’ college path. My ‘ruler’ is more the question (regardless of curriculum)- do they truly know how to learn? To pursue knowledge? Chase curiosity? That is an education that will serve them their whole lives long. Thank you so much for this suggestion…. we’re on the lookout too and I hope to find this and take a peek. It sounds like it could be a much better fit for my own girl. Always love a little glimpse into your world! I especially appreciate your bullet points under How Did We Know It Was Time to Move On? The three insights you mention can reveal so much about how a kid feels about his or her learning, on any topic. “Lingering”, particularly, is a great little sign to look for! I’ve never thought of it phrased that way, but I’m squirreling that word away, and looking for lingering in our homeschooling life! We used Apologia for my son and it was a great fit but for my daughter, who is beginning 7th grade in the fall, I suspect she’ll detest it – or elements of it. They are so different in learning styles. I do believe Apologia (Dr.Wile) materials are well layed out, not dumbed down at all which I appreciate, we like the regular tests and study prep. pages, and so forth. They do a good job of preparing students for higher level academic studies, in our experience. I recently came to the realization that when we finish our grammar book this year, we are going to just dwell on and reinforce what we’ve learned rather than moving on. Not so much because I think he can’t do it, but because I don’t think it’s necessary at this point. In a few years, we’ll pick it up grammar up again and add it into learning to write well. I love being able to assess my son’s learning style and know what actually needs to be ‘taught’ and what he’ll pick up from life and/or from just reading. And the things that need to be taught can be taught in the best way for him for that subject. Thank you, your post is really reassuring. Not even professional teachers can prevent “gaps” in their year plan! And they can seldom make changes when things do not “fit”, while we, in our homeschooling, can. What is important for us is that “Nothing is cast in stone!” The joy of learning is primary, while learning information is secondary. Information can be picked up at anytime, but when the spark is lost, there is a real danger of character damage. What a relief to be able to find alternatives! Sometimes I find the idea of switching is much harder on ME than it is for my kids, who just accept and move on. Meanwhile I can deliberate far too long instead of just listening to my gut! Thanks for this lovely encouragement, Heather! Thank you for sharing this as I have so often seen other homeschool parents stressing out over whether or not their current curriculum is working. It can be scary to see your child distancing themselves from what used to be a favorite subject and knowing when it’s time to make the change can be difficult. No parent wants to be in a situation where they’ve spent good money on a curriculum only to find it doesn’t work. It happens often, though, as often you don’t know how well the fit will be until after you’ve purchased and implemented it. Again, thanks for your honesty and willingness to share this experience. I think it will help many parents realize they are in the same boat and be more accepting of the need to make a change. I have a bit more confidence in myself as parent/teacher that I can and will do this as needed now. For us, in our fourth year of homeschooling, this is the year things became not so simple. We have always followed a Waldorf curriculum, and still do really, but we have added some things into our homeschool that are a bit more traditional, like spelling workbooks and a completely new math curriculum. And the biggest change for us recently is that daddy has been the new math teacher! It was a big step for me to be open to all of this change! Thank you for writing this. In it, I’ve found some language to describe some observations I’ve made this past winter. Very helpful and clarifying. Thanks for your encouraging post. We homeschooled two children through high school – and for newer homeschoolers, it is just hard to make a change! Bravo that you had the courage to chuck what you were doing and try something more suited to your child’s learning style. I, too LOVE the freedom that we have to try new things, experiment, and tweak until we get the right fit. Learning is fun with the right curriculum. I wrote something similar to your first sentence on my blog yesterday 🙂 I recently began using Five in a Row with one of my kids because she was unhappy and bored with that we were doing. Vive la homeschooling! Just starting preschool work with my oldest but I can say that we used Apologia for science in my highschool years and I can’t recommend it highly enough. Science was always my least favorite subject and this curriculum completely changed that for me! wow! that is really encouraging to hear, thank you megan! Every one understands that our life is not very cheap, however different people need money for different stuff and not every person earns enough cash. Therefore to receive quick personal loans and just car loan should be good solution.